The dining room at Coyote’s is simply decorated and generally quite comfortable, although the height of the partitions between seating areas can make you feel a little isolated in some spots. It is definitely a family oriented place and I noticed that some children seated at a couple of tables near me were each provided with coloring placemats and a large Tupperware container of crayons. The one thing… well, actually the only thing… that impressed me about the restaurant was the excellent service. I was greeted immediately by a very friendly and attentive young lady and the prompt service continued throughout my stay. In fact, at one point, another young woman serving at other tables, actually offered to re-fill my beer when my personal waitress was occupied for a minute or two elsewhere. There are separate menus for the restaurant and the lounge but, in fact, you can order from either in both locations and I was given the lounge version along with the restaurant one as I was seated. 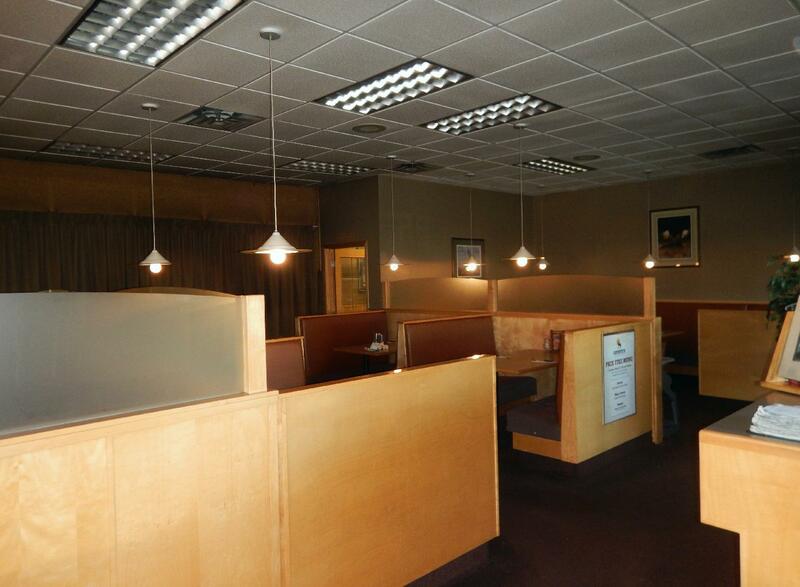 The Lounge allows for 19 separate appetizers and the restaurant offers a ‘mere’ 11. There is some overlap here, but each has a few that the other side does not, so it is worth perusing both carefully. The bar offers soups, sandwiches and wraps, for the most part, while the restaurant side has a wider range with a big selection of steaks and some interesting surf and turf combos. There are also a number of pasta dishes and ‘sizzle platters’, along with a nod to northern cuisine with local offerings of Char, Pickerel and Bison. I was little annoyed to discover, after ordering a couple of items, that the menu is currently being changed and several things I wanted are no longer available. Escargot – These were advertised as ‘Jumbo’ escargot but, in fact, they were the same relatively small ones you can buy in cans. They were sautéed in garlic butter with a topping of tomato, onion and mushroom, and it was possible, though I declined the option, to have the whole dish given a secondary baking with cheese. The garlic butter had a very tired taste as though it had been made ahead and sat for too long before use and the topping, though not bad, had a slightly bitter taste as though some component had burned (even though I couldn’t see what that might be). On the whole the effort was not very good and I could only give it a (generous) 2 out of 5. 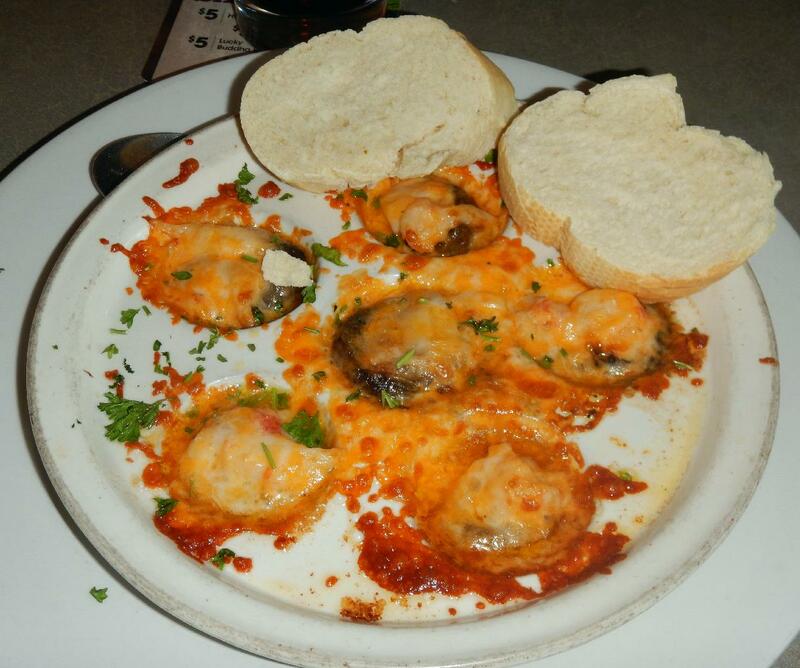 Lobster Bites – This consisted of lobster meat in mushroom caps baked with a cheese blend. The cheese was mostly mozzarella, as far as I could tell, but it was baked nicely so as to be both crispy and chewy. 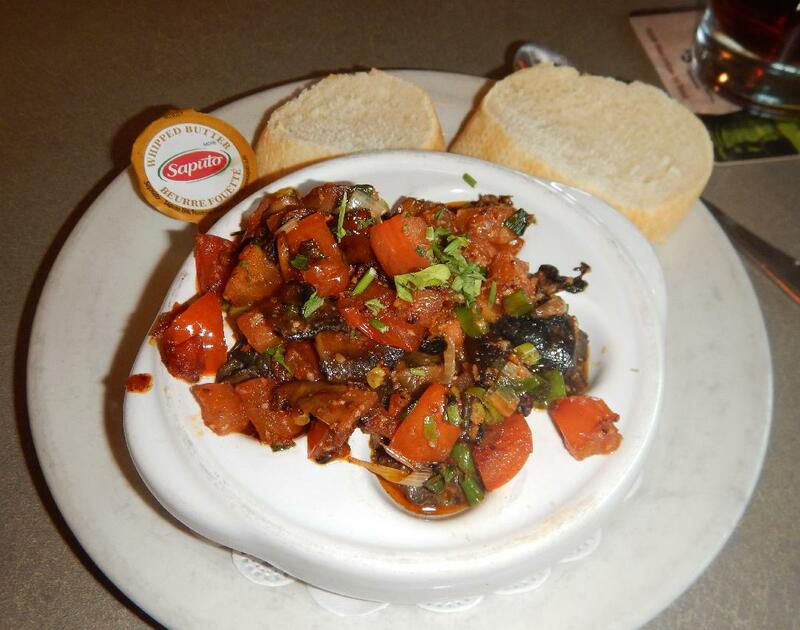 The mushrooms, just regular button mushrooms, I think, were moist and tasty and lobster was pleasant if sparse. All the components were well done but the combination didn’t work well, to my mind… The treatment might work well with shrimp, perhaps, but it was too overwhelming for the more delicate taste of lobster. It was nice enough, I suppose, but not really special and I felt, at best, it rated (but only just) a 3 out of 5. 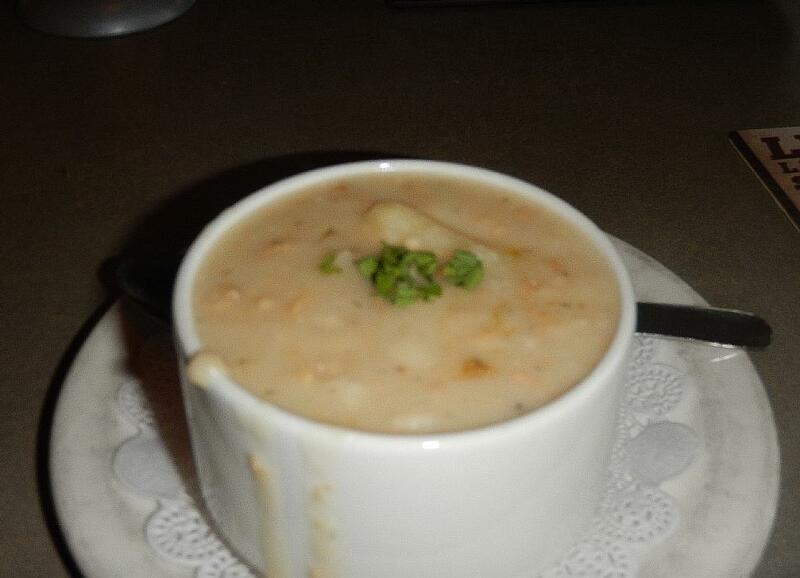 Northern Fish Chowder – This very hearty soup is made with char, whitefish and pickerel from Great Slave Lake. I eat char regularly, but whitefish and pickerel were both new to me and I liked them very much. I was glad I only ordered a cup serving rather than a whole bowl as the chowder was really thick and made heartier still with chunks of potato. To be honest, I make better fish chowder at home, but this was pretty decent and would be great on a cold, winter’s day. I gave it a 4 out of 5. I finished this meal wishing that I had opted for the steak I originally planned to have for dinner. I love trying different dishes from an appetizer menu but, aside from the chowder here, which wasn’t bad, the selections I had were not very impressive at all. Indeed, the one thing that saved the place from a very bad rating was the really top-notch service. I gave it a 3.5 out of 5. I like to order a selection of appetizers like you do but this time it appears a simple steak might have been better. Yeah … sort of a shame. 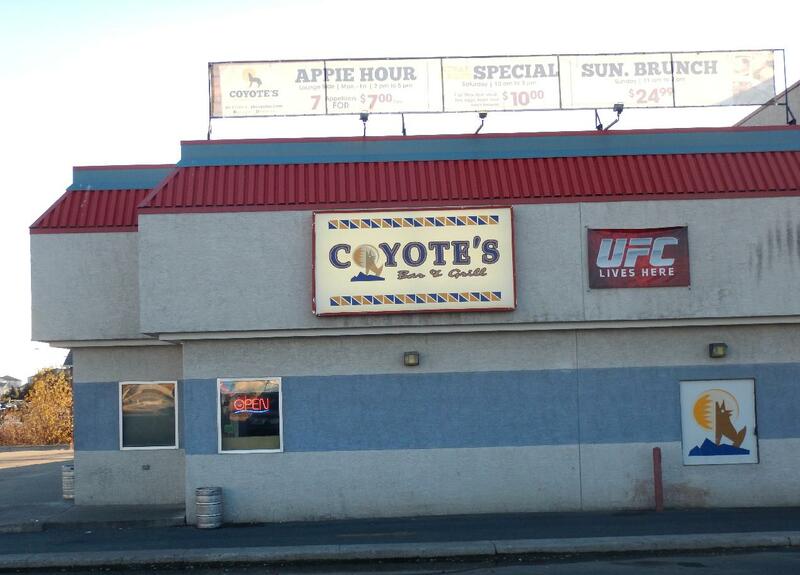 But I’ll have to go through Yellowknife again so I can stop by for a steak sometime.